This Vendor Agreement and Indemnification (this “Agreement) is made as of the date set forth herein below, by and between the undersigned vendor ("Vendor") and the EEC Englewood Event Center – Farmers Market. Vendor has received a copy of the EEC Englewood Event Center – Farmers Market Rules of Operation (the “Rules”) and hereby agrees to comply with the Rules. Vendor will use the Space solely for the purposes of the Market to sell fresh fruits, vegetables, flowers, sauces, meats, cheeses, other food products and / or ancillary items, crafts, clothing, health care products, cleaning supplies, etc. The Space shall not be used for any other purposes without the EEC Englewood Event Center – Farmers Market prior written permission. No alcohol or cooked concession style food shall be sold by any vendor with the exception of EEC contracted catering service, Parise Eats. The Market will operate on the first Saturday of every month and between the Hours of 9:00 a.m. to 3:00 p.m.
EEC will supply barricades and basic garbage cans for use in the market area by the public on each Market Day and will remove the barricades and garbage cans after 5:00 p.m. on each Market Day. Vendors are not allowed to dispose of large quantities of products such as unsold vegitables, boxes, packing, fruits, etc. Pack what you brought in, out with you, EEC is not your waste disposal site. Parties in any such action, Vendor shall, at its own expense, satisfy and discharge same. 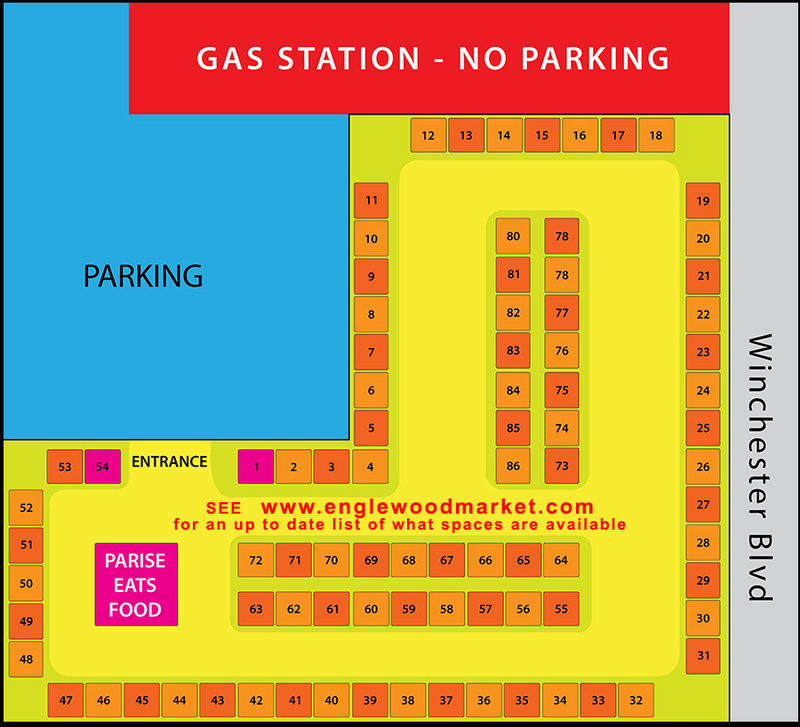 See www.EnglewoodMarket.com for the up-to-date list of what spaces are available. We will try to place you in the space requested, but there are no guarentees. EEC holds the right to make space changes if needed.